News X: #SanskariBullying: No short skirts in Chandigarh discos: ‘Ban skirts or face shut down’ says, administration. Catch News: Chandigarh discos ban entry for ‘seditious’, ‘scantily clad women’. Point number 3 above talks only of “exhibition or advertisement whether by way of posters or in the newspapers“, of scantily clad women, and not of scantily clad women themselves. Can Indian media not understand the difference between ads of scantily clad women and scantily clad women? Further, from where did media infer that “scantily clad women” = “women wearing short skirts”? Are skirts the only medium of being “scantily clad”? What is the genesis of this word “skirts”? In fact, this conclusion betrays their own small mindset. Point number 2 above talks about carrying out seditious activities. There has been a lot of debate on this and even without this “Disco Policy”, there are enough sections in the Indian Penal Code to take care of seditious activities, so what this law proposes may not be something brand new. Point number 1, talks about “indecent” character. These are three different, independent violations which have been listed out. But as usual Indian media has made a hash of the matter, either out of sheer incompetence, or deliberately. They have deliberately combined all the three points, added some imaginative bits about “short-skirts” specifically, and manufactured outrage-worthy headlines. This is nothing but lying. Is this a matter of priority? 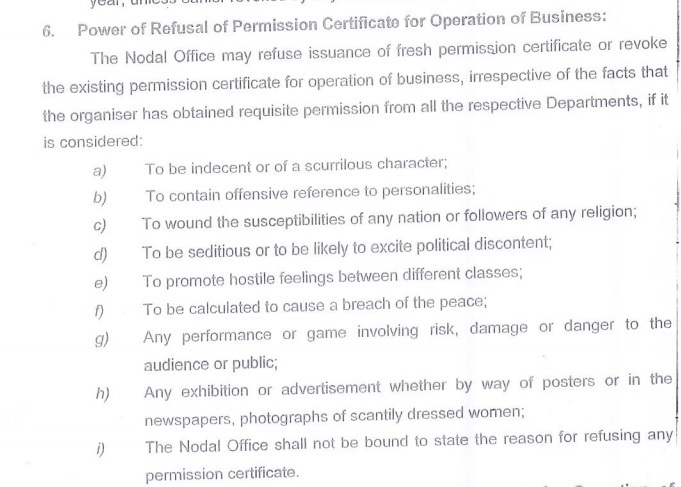 Why ambiguous terms such as “indecency” and “scantily clad women” have been used in the policy? These are extremely subjective terms and can vary according to the moral bent of each person. But our media, out of sheer incompetency or malafide intent, has managed to completely misreport a story. There is almost no chance any of these outlets will publish even a shred of an apology or clarification, and none of them will be taken to task either. AMU Students Union President Imtiaz in his statement called the ban as politically motivated and accused the government of doing Hindutva politics.